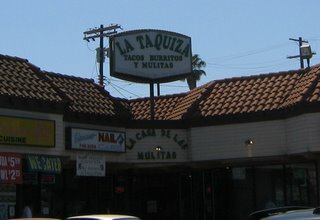 The sign says tacos, burritos y mulitas but the menu at this popular downtown LA taqueria doesn’t stop there. The combination plates are piled high with your favorite traditional mexican cravings,the seafood platters are delicious and the horchatas are some of the best in the city. The al pastor is roasted on a vertical spit, the asada char-grilled and the corn tortillas fresh and homemade on the spot. They also have a condiment bar with marinated onions and carrots as well as several salsa rojas and verdes. La Taquiza is everything you’d want a taqueria to be. It was hard to top the mulita but the carne asada was equally as pleasing. 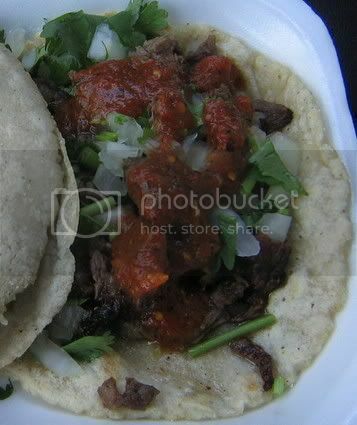 The tender juicy beef was charred in the right spots and the salsa roja provided a little kick. The soft toasted fresh corn soaked up the excess juices from the beef and salsa and I washed it all down with an ice cold rice horchata. Excellent taco and the mulita was delicious. 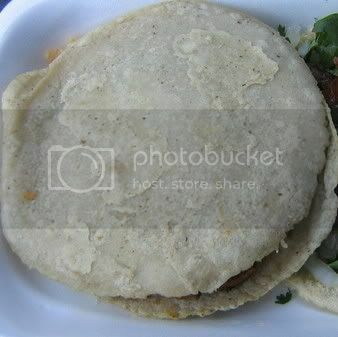 I'll be ordering mulitas more often when I see them on a menu to compare them to LA Taquiza. Not to be a nitpicker, but this isn't "The Great Quesadila Hunt". But more to the point, he did review Chanos (for the tacos) back in January. You can find the previous reviews on the right-hand column. by the way, the ensenada-style fish tacos are really what you should be ordering there. i get mine without guac, though. Well I must agree with you on this review. 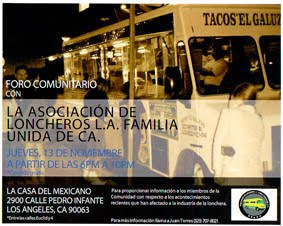 Everything else on the menu is extraordinary, but the TACOS are the best in LA. Now as far as the Mulitas are concerned as my Westside friend puts it "...just heavenly..."
La Taquiza is well worth your time. Now if you are a Trojan fan then you can stop by before the game because after a game they are swamped. You still get your food promptly after you order but the lines are long. Hey Bandini, J brought me 2 pastor tacos from here last night. She kept telling me "Bandini likes the tacos by USC". Even though it was 3 hours old, a simple nuke in the oven and the tacos were revived. 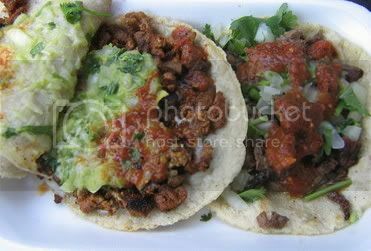 Very nice tacos. Thanks for the rec. Love it. There is one in South Gate on Tweedy as well. Really good food. No Microwaves, no can openers just fresh charbroiled goodness. They also make there own torillas. I finally tried La Taquiza tonight. The pastor, while tasty, reminded me of Jimmy Dean breakfast sausage. Not my thing. My decision to not move away from Los Angeles for graduate school was based upon not knowing how I would cope without mulitas from La Taquiza. With La Taquiza on one side and East Side Deli on the other, it's hard not wondering if LA is heaven.